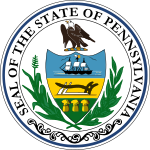 The 1940 United States Senate election in Pennsylvania was held on November 5, 1940. Incumbent Democratic U.S. Senator Joseph F. Guffey successfully sought re-election to another term, defeating the Republican nominee, Jay Cooke. ^ "Statistics of the Congressional and Presidential Election of November 5, 1940" (PDF). Office of the Clerk of the U.S. House. Retrieved 9 July 2014. This page was last edited on 15 December 2018, at 20:19 (UTC).